Why: MegaFest — T.D. Jakes’ festival of faith, film and family — will feature an Expo open to the public in Hall C of the convention center. Ministries and businesses will showcase their goods and services at the expo, plus there will be a stage hosting performances, activities and mini MegaFest sessions. In addition, each day during lunch, there will be a block party called Nourish that will include music performances by national and emerging artists, karaoke and lip sync battles, surprise celebrity guests, a hair demo, networking, giveaways and more. Why: The July 4th festival features a carnival, fireworks and Concert in the Park. Friday Night Concert- Randall King, Jason Boland & the Stragglers, and Cody Johnson. Saturday Night Concert– Drew Fish Band, Blacktop Mojo, Cody Canada and the Departed, Colt Ford. Fireworks both night at 9:45PM. Why: Bring your lawn chairs and blankets and settle in for a evening of music by Rock & Back Performing Arts School and the movie Sing. Bring a picnic, or visit one of the food trucks or the park concession stand. Why: Bluegrass music festival in historic downtown Wylie features 6 bluegrass bands, 200-vehicle car show, chili cook-off, arts and crafts vendors, great food. Musicians of any skill level are invited to bring instruments and jam in downtown stores, restaurants and on the street. Why:Celebrate the grand opening of Impact House, a new coworking and event space for social innovation, at the inaugural Expo Park Art & Wine Walk. Visitors can expect food trucks, local retail vendors, entertainment and, of course, wine. Tour some of the eclectic bars and Dallas’ best keep secret, Expo Park, with great specials starting every hour on the hour during the Art & Wine Walk. Why: The Colony’s Independence Day festival is an entire day of family fun at the lake including a parade, live music, activities for the kids, BMX stunt show, salsa shootout, watermelon eating contest, and a dazzling fireworks finale at 9:30 p.m.
Why: Billy Bob’s Fourth of July Picnic with Eli Young Band and Green River Ordinance and Charlotte Leigh and Lanco. Why: Thousands are expected to attend Addison’s annual Fourth of July fest which features an airshow, live entertainment, concessions, games, rides and 30 minutes of awesome fireworks. Kaboom Town! is free to attend but admission to Addison Circle Park will be cut off once capacity is reached. Visitors can enjoy the air show and fireworks display at Addison Circle Park or from any number of watching parties at surrounding restaurants and hotels. Once the fireworks are over, skip the traffic and stay for a high-energy concert with party band Emerald City on the Budweiser Stage. Why: Lone Star Park will present two spectacular nights of fireworks following the races. In addition to live racing and fireworks, enjoy additional entertainment for the entire family with live music and the expanded Family Fun Park. In addition, all members of the military will receive one free general admission. Why: The downtown Dallas skyline will light up with a fireworks show to celebrate America’s Independence Day. The festival is free and offers plenty of fun including the fireworks display, music, food, vendors, children’s activities and more. Why: Arlington’s annual hometown Independence Day celebration includes three Kids Zones, train rides, food trucks and carnival concessions, performances on three stages. Fireworks, set to music from 95.6 The Ranch, start at 9:45 p.m. Lawn chair/blanket, snacks, picnics and coolers are permitted. Admission is free but some Kids Zone activities require a fee. Free parking available at UTA. Why: Patriotic fest kicks off with patriotic music by the Southlake Community Band, fun crafts, games and inflatables for the kids. Fireworks start after dark (about 9:30 p.m.). The music and fun will continue after the fireworks Admission, parking and Kids Zone activities are free. Why: Pink Floyd’s Roger Waters will come back to Dallas as part of his US + Them tour. The concert will feature classic Pink Floyd, some new songs, and solo work. Waters’ legendary live performances are renowned as immersive sensory experiences featuring high class, state-of-the-art audio visual production and breathtaking quad sound. Why: The city celebrates the Fourth of July with family-friendly activities, live entertainment and a fireworks show(7PM). The event begins with a parade and classic car, truck and cycle show downtown. Red, White, and Boom! 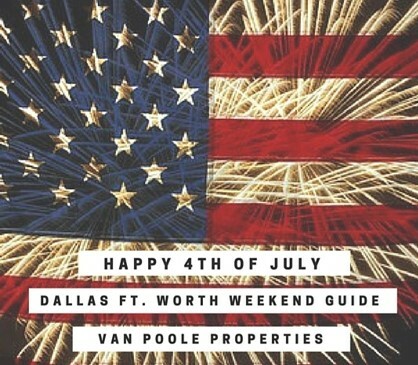 Parade – 10 a.m, Yankee Doodle Block Party – 11 a.m. to 2 p.m, Car Show – 1 p.m. – 5 p.m.
Why: Celebrate Independence Day in Fair Park, the national historic landmark located in the heart of Dallas with historic art, architecture, museums and fountains. Admission is free. There will be many family activities, concerts, and Midway rides (like the Texas Star and the Top o’ Texas Tower). The event comes to a dazzling end with a fireworks display around 9:45 p.m.
Why: Fort Worth’s Fourth is celebrating our nation’s independence along the Trinity River. The family-friendly festival returns, and as always, general admission, tubing, and KidsZone activities are absolutely free. Expect a fun-filled afternoon of family activities, tubing and fly board shows, plus live music from self-proclaimed Tex-Mex Honky Tonk band, the Tejas Brothers. The high-energy band will play dance favorites and pump up the crowd for the spectacular fireworks finale. On the shore stage, 95.9 the Ranch will host three local bands in the Battle of the Bald Eagle Battle of the Bands contest. Flyboarders will also be performing lively shows on the river in between music acts, then right before the fireworks show lights up the sky. Why: Celebrate Independence Day with a patriotic Party in the Plaza, live music, a Children’s Expo and more. Other fun attractions include Taste of Frisco, an FC Dallas soccer game and a big fireworks display at approximately 10 p.m. Don’t miss the Dachshund Races and Hotter N’ Firecrackers 5K on Monday, July 3. Why: Cap your July 4th celebrations with a big bang at Plano’s All American Fourth Fireworks at Oak Point Park. The firework show is synchronized to music, so tune into radio station 97.5 KLAK for live simulcast. Come early to get a great spot for this spectacular pyrotechnic show. It’s FREE and plenty of parking is available. Spring Creek Parkway will be closed between Parker and Jupiter Roads from 4 pm until end of show. Bring your blankets and lawn chairs and celebrate Independence Day.